As anyone who runs a household knows, successfully maintaining a “happy home” can be just as difficult as running a business. So why not shop for your home supplies in the same way a business shops for theirs? Organizing your grocery list in a clear and simple way can save you and your family time and money when making those weekly trips to the grocery store. That is why you should download this, free, easily-customizable, Food Inventory Template, here! Because we often buy a lot of the same things at the grocery store, making a general list of items and inputting them into your food inventory chart can cut your shopping time in half and ensure you are budgeting properly. This food inventory list allows you to fill in all the items you regularly buy plus any other extra products. An organization tip, you may want to start your list with the items you buy most frequently and work your way down to the items you buy less frequently. If you usually go to the same grocery store you could also think about organizing your list into sections. For example, you may want to put all your dairy items together (i.e. milk, butter, etc.) Finally, you could also organize your list alphabetically so that as you scan through you can find items quickly and easily. 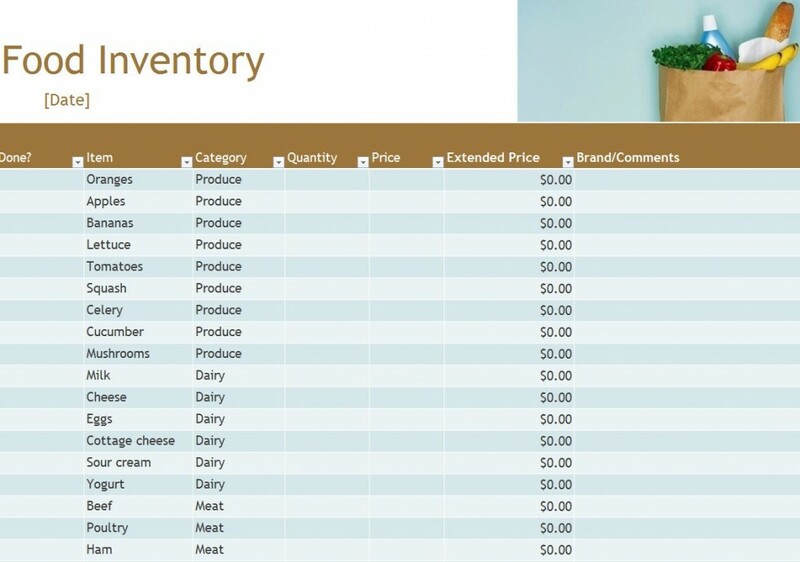 When using this food inventory template, simply input the item or product in the column entitled, “Item”. Depending on how you want to categorize your grocery list, you can than input what type of product you are referring to. Again, for example, if you organize your list by section, you would put all your produce items into one section and your dairy products in another. Next, input your quantity purchased and the price of each item. If you would like to keep track of the overall price, you can input it in the “EXTENDED PRICE” section of the food inventory template. This Food Inventory Template is the best way to keep track of your household’s nutrition and financial situations. Download it now and start shopping in a better and more organized way!